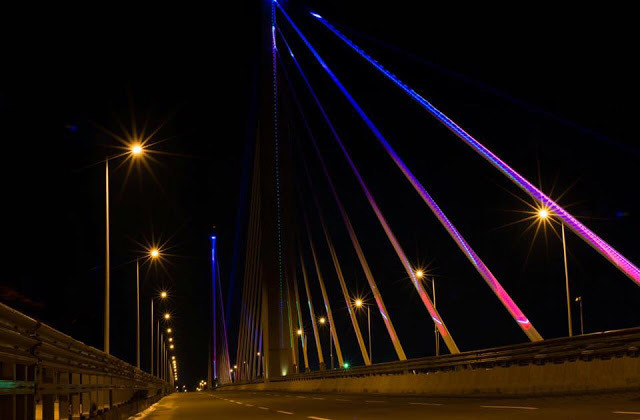 The Nyerere Bridge in Kigamboni, Tanzania, is illuminated with spectacular effects lighting every night. Lasers manufactured by the Laserworld Group are used for main effects: 4 x RTI NANO RGB 30. The bridge is 680 meters long - a distance, which needs to be challanged by the lasers to illuminate the long pedestrian lanes. RTI NANO laser systems are especially suitable for long distance beam shows and bigger outdoor installations. Especially the wide projection distance is a further fact why high end laser systems of the RTI NANO series were used to highlight the bridge: the systems combine extreme power with very high accuracy. It‘s also possible to access the configuration settings for color, scanning and other parameters directly through a browser application, which is necessary for a huge outdoor laser show like this as well as a durable and a dust-proof housing making the systems nearly maintenance free.